On my way back home from Memorial Day shopping in Costco I noticed from Lawrence expressway overpass over Caltrain tracks the homes of Bordeaux Sunnyvale KB Home development and decided to take a look what else is going on there. Eighty homes Bordeaux Sunnyvale development located near Lawrence Caltrain station Caltrain on the corner of Aster and Willows avenues. 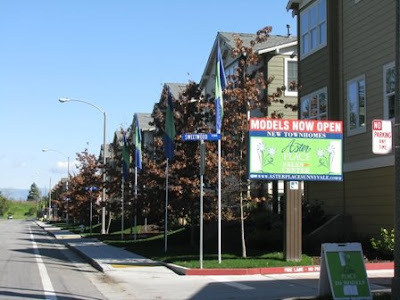 Next development on Aster avenue is forty-two unit townhouse Aster Place Sunnyvale project by Citation Homes. I noticed a few strengths about Bordeaux Sunnyvale and its rival Aster Place Sunnyvale: new development, walking distance to Caltrain station (gas is not cheap anymore), and Sunnyvale School District and then Fremont Union High School District schools for kids. As for weaknesses I would mention proximity to Caltrain tracks and the yard of stone and brick manufacturer Peninsula Building Materials across the street from Bordeaux by KB Home and Aster Place by Citation Homes. Last, but not least I drove near the development of 130 units Evelyn Glen KB Home project on the corner of Evelyn, S. Wolfe and Caltrain tracks in Sunnyvale. This development was already sold out, but not to happy homeowners yet. The previous land owner Standard Pacific Homes sold eight acre lot of Evelyn Glen development lot to KB Home. The sales center expected to be open in summer 2008. I was searching for information on Bordeaux (KBhomes) and came on your blog... YOu have not written anything on what are the pros and cons according to you. what you think of the schools and whether it is a good buy for new families. I cant understand when the Aster Ave. is under santa clara school dist. why this particular address falls under Fremont High? Kids from Bordeaux by KB Home should go to Sunnyvale School District and Fremont Union High School District, but you better check with the districts, because they can change borders for next school year. new homes are selling like hot cakes. Verona on Tasman have actually hiked their prices. Also they have a preium price on properties arnd the green patch... and the school district have nothing impressive to state... what is the reason that new homes are selling at this rate?? Do you own a KB Home in California? KB Homes California operation, including all SF Bay Area developments, is under investigation.